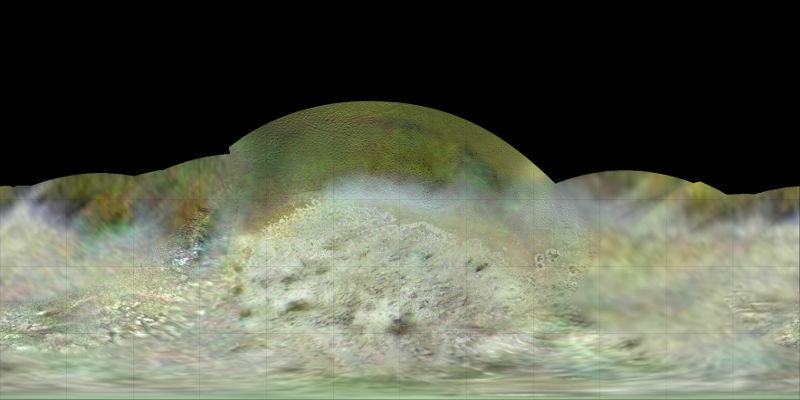 Dr. Paul Schenk, a scientist at the Lunar and Planetary Institute (which is part of the Universities Space Research Association research organization) in Houston created this map of Triton. He used data gathered by the Voyager 2 spacecraft as it had flown by Neptune’s moon Triton in 1989. This is considered to be one of the best mapping of Triton. Triton is the largest satellite/moon of the planet Neptune and was discovered by British astronomer William Lassell on October 10, 1846. 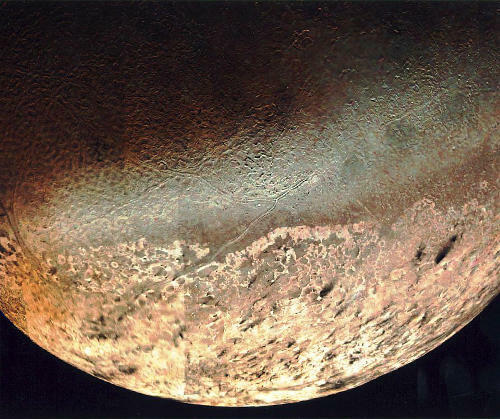 Voyager 2 took this close up image of satellite Triton during a close flyby on August 25, 1989. This composite image was constructed using about a dozen pictures and the colour correction was added to the lower resolution images. Triton is relatively flat with some outcrops, ridges, plateaus, icy plains and a few craters. The large south polar cap at the bottom of the image is highly reflective and slightly pink in color; it is believed that it may consist of a slowly evaporating layer of nitrogen ice deposited during the previous winter. Neptune is the eighth planet from the Sun and has a nice bright blue colour. Its bluer than Uranus, which has more green, because of an atmosphere that is composed of methane, hydrogen and helium. The high amount of methane absorbs just the red light from the visible spectrum and reflects the blue light. Hence Neptune appears very blue to us. 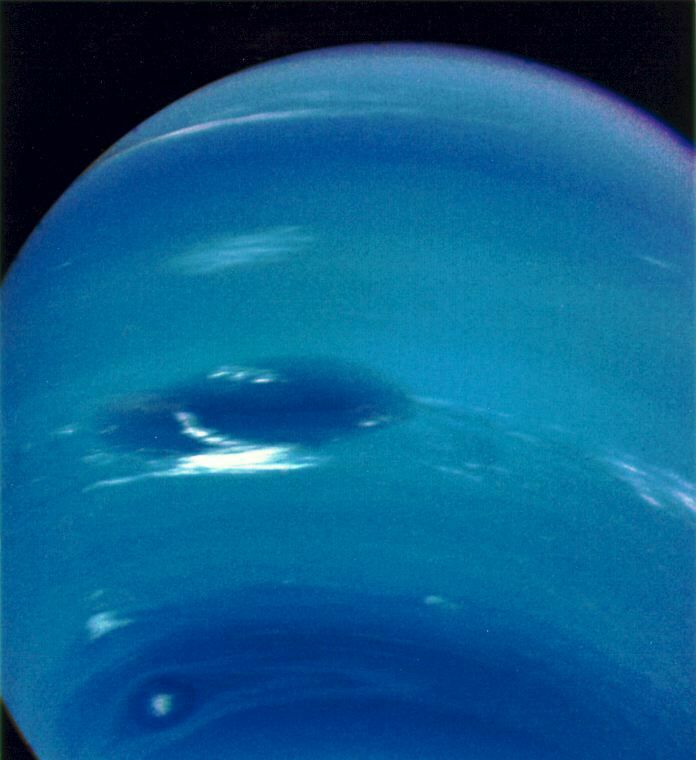 The above picture of Neptune was taken by NASA’s Voyager space probe and focuses in on the planet’s dark spot (a very large anti-cyclonic storm system). 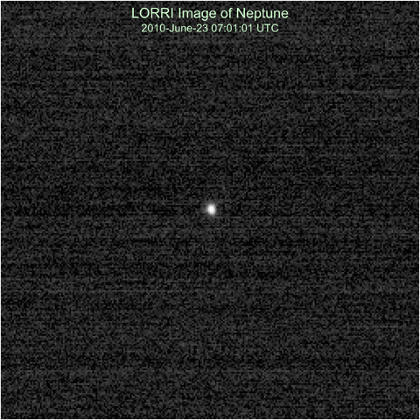 NASA’s New Horizons Space Probe is equipped with a Long Range Reconnaissance Imager (LORRI). This device was used to photograph the planet Neptune with a 100 ms exposure, even as the probe was 2+ billion miles from Neptune. The planet Neptune with a bright blue hue from an image taken by Voyager 2 using its orange and green filters, at a distance of 4.4 million miles from Neptune. The blue/green colour of Neptune is also interesting to note because the ancient Roman religions had Neptune as their god of water and the sea.